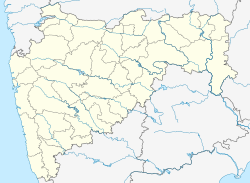 Shirdi Airport (IATA: SAG, ICAO: VASD) is located at Kakadi village, about 14 km South-west of the town of Shirdi in Maharashtra, India. The airport, spread over 400 hectares, is owned by the Maharashtra Airport Development Company (MADC) and was inaugurated by President Ram Nath Kovind on 1 October 2017. Communication Navigation Surveillance (CNS) and Air Traffic Control (ATC) at the airport will be managed by the Airports Authority of India (AAI). The Rs. 340 crore airport project is part of the State Government's effort to promote religious tourism at Shirdi, known for the temple of Sai Baba, among the most revered spiritual gurus in India. Around 80,000 devotees visit the temple town daily and the numbers go up to 5 lakh per day during weekends, vacations and festivals. These pilgrims access Shirdi via road, Sainagar Shirdi Railway Station and the Aurangabad and Pune airports located 125 km and 186 km respectively from Shirdi. The airport is equipped with a runway 2,500 metres (8,200 ft) in length. The terminal covers 2,750 square metres (29,600 sq ft) and has a capacity for 500 passengers daily. Currently Shirdi Airport is going through the Runway Extension from 2,500 metres (8,200 ft) in length to 3,200 metres (10,500 ft) in length to facilitate International Flights landing. Entire Project is executed by Vasishta Projects-based out of Hyderabad under the MADC (Maharashtra Airport Development Corporation) management's guidance. ^ "Shirdi gets international airport". Deccan Herald. 1 October 2017. Retrieved 1 October 2017. ^ "Flights to Shirdi airport likely by October". The Indian Express. 19 August 2017. Retrieved 21 August 2017. ^ "Shirdi airport work in full swing: Official". Times of India. 2 July 2010. Retrieved 25 April 2012. ^ "Shirdi airport to become operational by Dec 2011". Articles.timesofindia.indiatimes.com. 11 December 2010. Retrieved 2 October 2018. ^ "Shirdi airport delayed due to runway modification". Daily News & Analysis. 4 August 2010. Retrieved 25 April 2012. ^ a b "Shirdi airport not to meet Nov deadline". Indian Express. 17 October 2012. Retrieved 22 December 2012. ^ "Shirdi Airport to be completed in 3 years: Sahay". NewKerela.com. 15 January 2012. Retrieved 25 April 2012. ^ "Maha govt seeks aerodrome licence for Shirdi airport". Business Standard. 7 February 2016. Retrieved 9 February 2016. ^ "First test flight from Mumbai lands at Shirdi airport in 45 minutes". Hindustan Times. 27 September 2017. Retrieved 1 October 2017. ^ "Shirdi, India to open to commercial traffic in early 4Q17". ch-aviation. 25 September 2017. Retrieved 1 October 2017. This page was last edited on 2 March 2019, at 12:56 (UTC).